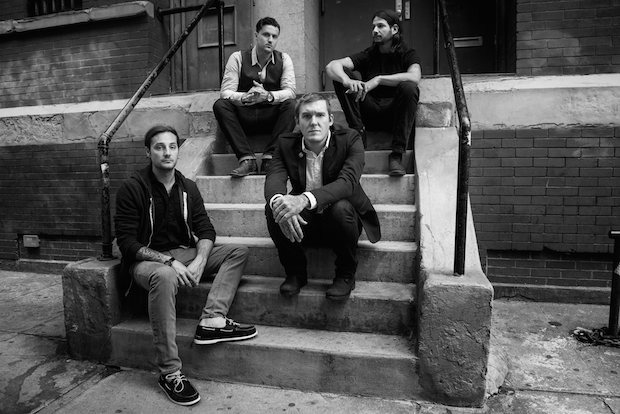 The Gaslight Anthem is one of many bands who have offered a free single to those who pre-order their new album. Photo by Drew Gurian. If you saw the headline of this article and the words "giving away" sent chills down your spine, I hear your fear. We're all well aware of how often artists are asked to work for free, and I know how seriously you take your music career. With so many conflicted reports that have come out recently – from this past December’s article in Spin regarding Spotify’s payouts, to a slightly disgruntled Grammy-nominated artist revealing his royalty statements – it would appear that the only way artists can survive is if they scrape together every penny they can possibly make off their music. (Be on the lookout, because the digital age is promoting change). However, the dilemma is always going to be that as a new artist, you need a way of getting your music heard and attracting new fans in the first place. So rather than shutting out potential ears, pay-what-you-want or free singles allow people to explore your music at a no/low cost risk, and can actually end up earning you more money in the long run than if you had specified a price tag. Interestingly enough, other markets have taken note of this and have delved into this model as well, as detailed in this Freakonomics study. Television pilots, trailers, food samples, trial size cosmetics... lots of industries bank on giving consumers a sneak peek. Music isn't that different. After all, countless musicians become well known once people hear their song on a television show and Google it to find the source. Giving your audience a taste of your sound will lead them to your other work! Often enough, a PR rep will send me a download link of a single or album in hopes of a review. I have to be honest, though... it's so much easier if I'm sent a link where the track is streaming already. Not only does it save me the step of unzipping a file or going to Dropbox, but I can link to it or embed it in my review post, share it on social media and more. Easy accessibility is key here. How many videos or tracks can you think of that have gone viral and required a purchase? Exactly. Many artists promote their free tracks as a contest or as a way to build their fanbase and community. For example, Tweet for a Track allows users to snag your song in return for promoting your music. Some bands will give away a track when a new fan subscribes to their email list. Others allow fans to download a free single when theypre-order their new album, like The Gaslight Anthem recently did. The weight of building this following reimburses you, so to speak, by gaining followers to help you get gigs and boosting your visibility to industry execs like music supervisors. A free download or stream doesn’t have to be permanent. Lots of high profile artists allow fans to listen to their new single or album for a limited time, like Fiona Apple and Daft Punk did. When there's an expiration date, it creates a sense of urgency that will make your audience more inclined to listen immediately – and if they like it, they'll do the promotion for you by spreading the word. Some musicians offer a "pay what you’d like" deal for downloading an album. When asked about this model at the last Rethink Music Conference I attended, Amanda Palmer compared it to when she was a street performer and could expect to make a certain amount each day. In a nutshell: With a price tag, people feel more inclined to illegally download. On this kind of "honor system," people feel the need to give something – which in many cases, could be more than what you would have charged. There are many opportunities to make money with your music, from licensing to playing shows to merch sales to music publishing income. In fact, there are over 40 types of revenue musicians can make! As long as you remain up-to-date on the on the different types of revenue streams that are available to you, not setting a price tag on your tracks every now and then can help you build your fanbase and your bank account. What are your thoughts on giving away tracks for free? Join the conversation on Facebook and Twitter. Farah Joan Fard is a writer, drummer and media professional with experience in music journalism, licensing, performance, producing and audio engineering. You can follow her work at @LaParadiddle.